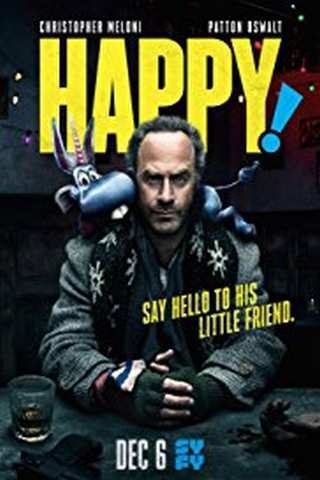 Bringing the grimy, surreal world of Happy!, Grant Morrison and Darick Robertson's graphic novel about a corrupt cop making his way through a filthy, violent Christmas tale, might have seemed borderline impossible to imagine in live-action not long ago -- but changes to the TV landscape have made the Syfy almost an obvious choice for a small-screen drama. Morrison, who serves as an executive producer on the show and who has been involved in every step of the series' development, told ComicBook.com during a recent interview that while Syfy and the creative folks on the TV side of Happy! were accommodating and easy to work with, there were still changes that needed to be made to the series...not to rein in its insanity, but rather to expand the universe in case of future installments. The veteran writer said that while his original idea for a TV series based on The Filth failed to go forward in the 2000s in spite of moderation to the source material, that sort of conversation is much more rare in the current TV climate. The difficulty, then, was juggling the needs of the story -- which had a very definitive beginning, middle, and end, and which has a small but fiercely affectionate fan base -- with the needs of a TV show, which wants to essentially leave the door open to go on indefinitely. Happy! airs on Wednesday nights at 10 p.m. ET/PT on Syfy.